Over the weekend, online auction-house ebay removed an anti-racist painting critical of George Zimmerman on the same day it allowed Zimmerman to sell one of his own paintings for over $100,000. Zimmerman’s medium is “regular household latex paint,” which he used because “I needed to put these visions onto the blank canvas as soon as possible.” George Zimmerman currently owes his legal team over $2.5 million. 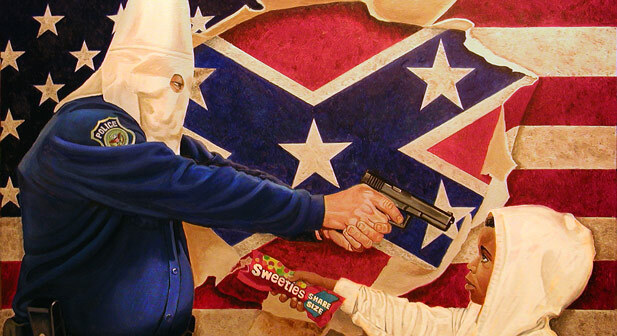 On the same day Zimmerman’s auction closed, ebay removed the anti-racist painting that artist Michael D’Antuono had created in the days after the death of Trayvon Martin. Fifty percent of the proceeds from D’Antuono’s auction were to have gone to the Trayvon Martin Foundation, and with five days left to bid, the price for the painting had already exceeded $25,000. D’Antuono told Raw Story that he was “outraged” that eBay would mistake a criticism of a hate-group for a statement that “promot[es] or glorif[ies]” one. D’Antuono will attempt to auction the piece off privately, and remains committed to donating half of the proceeds to the Trayvon Martin Foundation.